Improve your finger strength! Perfect for athletes, musicians, and office workers. Designed to increase both your grip strength and finger dexterity. Easy to use anytime. You can take your hand grips & rings with you wherever you go. Portability allows you to train whenever you have a few moments of free time. Built to Last. Specifically designed to be durable. We stand by the quality of our products and want you to rest assured that you'll have an excellent experience. Comfortable to Use. Ergonomic design ensures that you'll be able to train for long periods while remaining comfortable. Created using a soft silicone that prevents callouses. If you're suffering from arthritis or carpal tunnel, take notice! You can start exercising to improve your situation today. If you suffer from arthritis or carpal tunnel, this product will be of great use to you. Likewise, those suffering from conditions such as tennis elbow or other forearm injuries can benefit from using this. It's also an excellent trainer for musicians seeking to increase the dexterity in their fingers. We use our hands every day. There are so many activities that we use our hands for that it can be overwhelming on the muscles in your hands. Everything from typing, gardening, driving, using your smartphone, and even cooking can contribute to fatiguing your hands. With age, our hand strength begins to weaken. Do you work on a computer all day and find that your fingers are getting tired by the middle of the day? If you're one of the millions of people who work on a computer all day, then you know how tired it can make you. Your hands will start to hurt and you might even be in pain by the middle of the day. What if I told you that there was a product that could help to strengthen your hands and wrist? Introducing the Finger Stretcher & Hand Grip Strengthener Pack for Wrist and Finger Training. This product will be of great use for those who suffer from arthritis or carpal tunnel. Likewise, those suffering from conditions such as tennis elbow or other forearm injuries can benefit from using this. It's also an excellent trainer for musicians seeking to increase the dexterity in their fingers. Buy this Pack of 1 Finger Rehabilitation Training Ring + 1 Finger Stretcher to see results fast! They can be used anywhere and at any time. Their portability makes it so that you can take them with you wherever you go. Whether you're on the bus or simply sitting around watching television, you can idly train your hands using these rings. It's a simple exercise to do and the results will be apparent quickly. Increased hand strength and dexterity will be great incentives to make use of your rings regularly. Excellent for conditioning your hands exterior muscles. Can help to prevent hand fatigue, arthritis, muscle strain, and even early signs of carpal tunnel! Rehabilitation & Recovery – The stretchers can help your muscles to recover after you've undergone hand or forearm surgery. Each stretcher indicates the resistance strength by its color. Make the decision on which resistance strength you're most comfortable with. There are three different tensions you can choose from. Light tension is color coded as green. Medium is color coded as blue. Heavy tension is color coded as orange. Light tension is recommended for those who are new to hand exercises. Medium tension is great for maintenance if you already have a strong grip and good hand dexterity. Heavy tension is recommended for those who want the most strenuous hand training. Perfect for rock climbers, weightlifters, guitarists, and others who want to cultivate hand strength. Increase your grip & forearm strength in various different ways. Take a look at some of the various exercises you can perform using these rings. 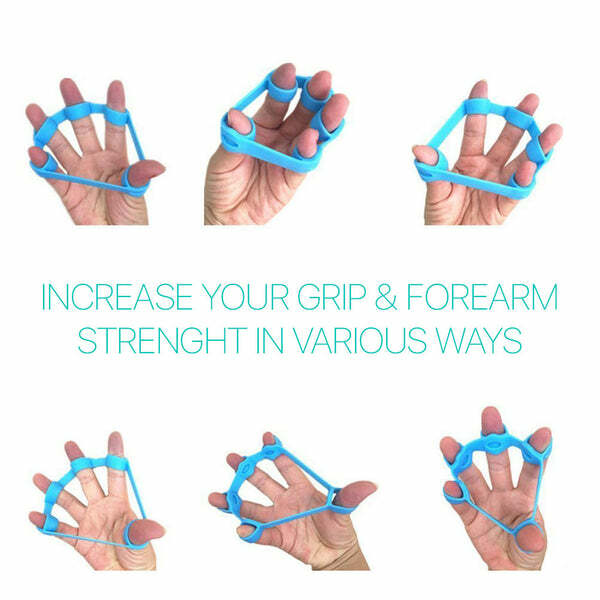 There are many different ways you can use them to increase your grip strength and finger dexterity.